With dynamo hubs, lights and chargers becoming better by the day, I’ve been getting a lot of inquiries about how to wire up the best hub dynamo system. Now, I won’t be going into the detail about each individual component, rather this resource is about understanding the hub dynamo system as a whole. Here you’ll find information about the plugs, connectors and other products that are designed to build a better hub dynamo system. Let’s start with a component map to understand how everything pieces together. This hub dynamo system map should give you an idea how everything wires together. Most dynamo hubs spit out their power via two spade connectors at the axle. A less common connector design is the Schmidt SL fork dropout. 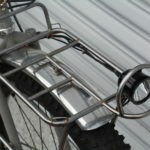 This is a really neat design; the connection happens between the edge of the hub and a fork dropout plate that’s soldered to the wiring. Unfortunately, you’ll rarely find the Schmidt SL dropout on anything but custom-built forks. A crimper tool is an ideal way to fit Schmidt spades to bare wires. With a good crimping, the dynamo cable will look neat and be fixed very firmly to the spade. It’s a really good idea to use a bit of heat shrink over the spades to protect them against the elements (they can corrode). At a pinch, I’ve used a pair of pliers to connect spades, but you won’t get that nice spade curl without a crimper. A crimping tool will ensure the strongest and neatest spades. One advantage to the Schmidt spade design is that you can use ‘piggyback’ spade connectors at the hub. These connectors have a second set of spades built in, allowing you to connect two extra wires (ie. your USB charger) to the system. Wiring both lights and a charger simultaneously is not a problem provided there is an on/off switch on the light (or charger). This is because piggyback connectors will send power to both your light and USB charger. Unfortunately, there’s not enough power to run your lights at full brightness AND get a decent charge, so you can use the light ‘off’ switch to divert 100% of the power to the USB charger, or you can unplug devices from the USB charger with the lights ‘on’ for maximum illumination. If you’re using the Shimano connector design, the best way to get power to both your lights and USB charger is by splicing the four cables together. This will produce a single set of cables with spade connectors at the end. Again, you’ll want to make sure that your dynamo front light (or USB charger) has an on/off switch because like piggyback connectors, spliced cables send power everywhere. If your front light (or USB charger) does not have an on/off switch, you’ll want to incorporate a two-way switch elsewhere into your system. Two-way switches send 100% of the power from your hub to either your light or charger. Switches also allow the physical size of a dynamo light to be greatly reduced. Check out two-way switch products from Igaro and kLite. The kLite BAR Switch will allow you to toggle between charging and your light. There are a few ways to ‘break’ your cables. You may need to do this to extend the length of a dynamo cable, or perhaps it will help with removing components of your system when packing a bike into a box. I like to keep my system as modular as possible! I use the ultra-neat Supernova Gold Connectors (US $16) in order to disconnect my rear light from my front. 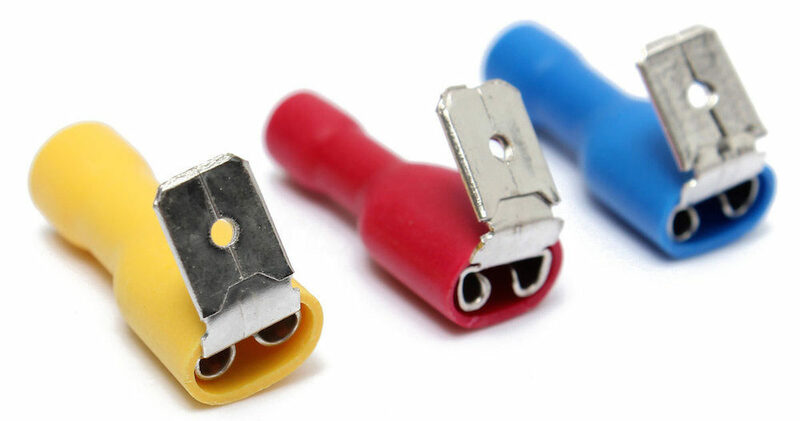 Alternatively, Schmidt makes some small and highly cost-effective 2.8mm spade connectors for a fraction of the price (US $0.20) which essentially do the same job. A more recent development are Dyna-Snap magnetic connectors. 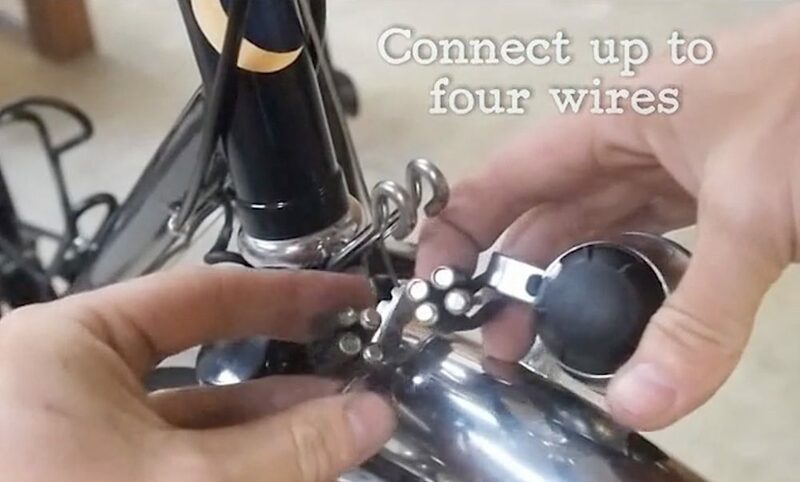 Using magnetic cable ends, you can disconnect parts of your dynamo system in an instant. An obvious advantage to this system is for easy front wheel removal. As there’s no delicate spade-locating required, the magnetic connectors can automatically find each other when in proximity. 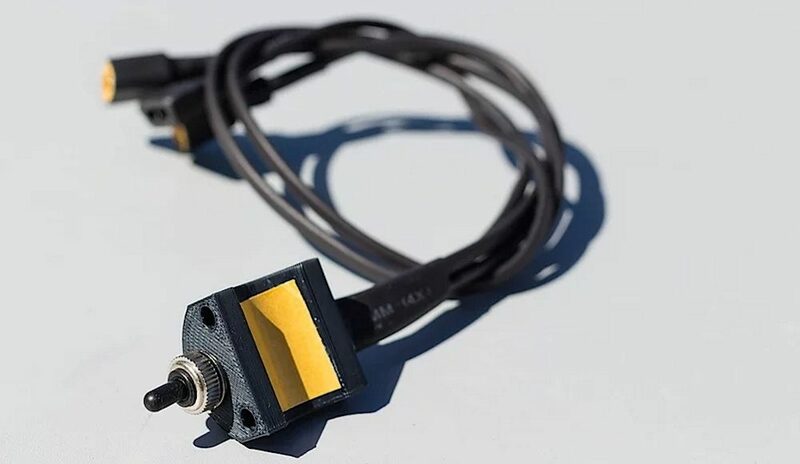 The Dyna-Snap magnetic cable connectors allow you to quickly disconnect cables. 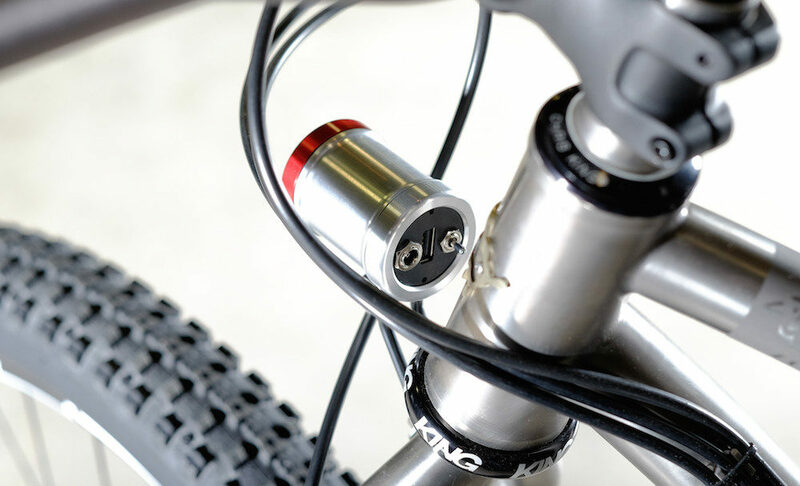 The power from a dynamo hub will drop too low for charging when your speed is below ~12km/h. GPS devices tend not to like this, displaying a rather annoying ‘lost external power’ message whenever you stop or slow down. Smartphones also don’t enjoy charging on a varying voltage, so to get the most out of your charging system you should plug a cache battery into the USB charger, and your phone/GPS into the battery. At higher speeds, the battery will store power which will be used to keep a constant power supply for your GPS/phone at the low speeds or when stopped. A cache battery with power passing directly from input to the device has no loss in efficiency. But when the power is stored in the cache battery rather than being used straight away, that’s where you will experience a loss of 15-20%. There are a few things to note about getting a cache battery. Some larger batteries (10000mAh+) will have a minimum current input of 1A, while most USB chargers will be delivering 0.5A for the majority of the time. This renders those batteries incompatible. You will also need to find a battery that can be discharged while it’s getting charged (‘pass-through’ charging). Lots of battery manufacturers will not permit ‘pass-through’ charging because it limits the lifespan of a battery. The best source for pass-through batteries is often through solar power kit manufacturers. To learn everything about cache batteries click through to my battery resource HERE. There’s a few integrated dynamo lights/chargers which are cost-effective and elegant as they incorporate all of the electronics, including a switch, into the one simple unit. Keep in mind that they don’t include a cache battery – you’ll have to add one to achieve a constant charge at low speeds for smartphones and GPS devices. To learn everything about dynamo lights and beam patterns, I recommend clicking HERE. At typical cycling speeds, you will not get a good USB charge and have a decent beam lighting the road – it’s one or the other. Given the latest LED and lens technology, you can now buy dynamo lights that are over 100 lux or 1200 lumens at 20km/h (12mph). That’s more than enough for everything on the road, as well as most off-road stuff too. Some off-road dynamo lights can have power coming in via a battery for slow riding too (Exposure Revo, kLite Bikepacker Pro, Sinewave Beacon). You can achieve a decent charge at relatively low speeds with many of the USB chargers. This is enough to charge a phone or GPS in a few hours provided your speed doesn’t drop below 15-20km/h. In terms of electrical resistance, you can expect to lose about 5 watts of pedalling power with your dynamo system on, and 0.25-1.00 watts when it’s off (when compared to a regular front hub). Click HERE to read all about dynamo hub efficiency and the effect on your riding speed. Building a hub dynamo system takes a little bit of know-how, but it’s quite straight forward once you’ve got the basics. 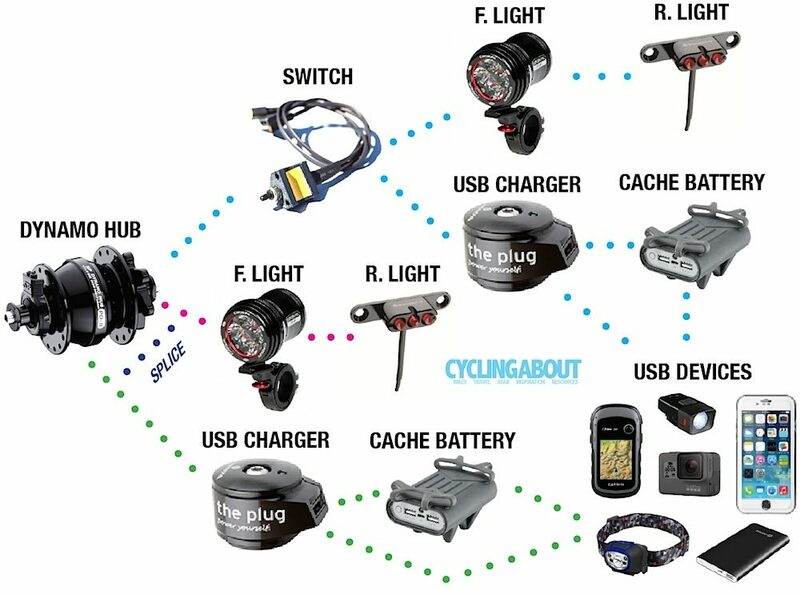 I generally recommend starting with a dynamo hub, front light (with an on/off switch) and a USB charger. Either splice your cables together (Shimano design) or fit up piggyback spade connectors (Schmidt design) to get everything wired up neatly. Try to put a few cable ‘breaks’ in your system to keep it modular – especially if you’re planning on taking sections off your bike (fork, rack etc) for both flights and general bike mods. There’s so much more to know about dynamo light beam patterns and USB chargers. Have a hunt around the site and you can find out much more information on it all.